The confetti has long since been cleaned up from the floors of the most exclusive of country clubs, the banners removed, and now, the GOP is headed into a new frontier: Targeting college-aged young men and women. 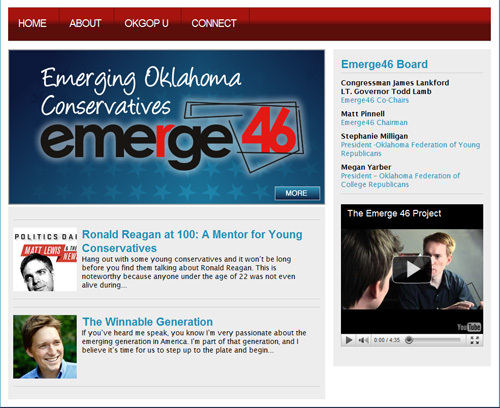 Emerge46 is the Oklahoma Republican Party’s program for the emerging generation of conservatives here in the 46th state in the union. Whether you are in college, starting your career or starting a family, this program is for you. We aren’t up to bat next; we are up to bat now. We are the emerging generation; not the “next” generation, and it’s time for us to step up. This program will connect you with College Republican and or Young Republican clubs and activities. We will be a financial supporter of these organizations, and will provide them with training and tools to help further conservative Oklahoma candidates and causes. So check out our website, and connect with us. We are going to find out once and for all just how powerful a force the emerging generation can be for the conservative movement. Creative, aggressive and having the feel of a LifeChurch.tv promotion, Emerge looks to be one of the more expensive endeavors the GOP has launched in Oklahoma for quite some time but from a marketing perspective, is on target. Democrats in Oklahoma have been much more assertive in their outreach to college-aged voters and the universities are fertile breeding ground for the next generation of liberal voters. Emerge 46 appears to be the GOP answer to the Democratic activism by providing a network, a central location to distribute literature, to train young conservatives in fund raising and "develop new talent" for future Republican campaigns. So, if you've been contributing to the Oklahoma GOP or have contributed to candidates who have in turn sent their money over to the Oklahoma GOP, you now know where your money is being spent. Remember the story of the three children who died in the RV fire last month? Well, according to the Oklahoman, the parents are now being charged with felony child neglect. The mother whose three children died Jan. 4 in a motor home fire had left them alone there, locked inside, while she was under the influence of methamphetamine, police allege. Drug use, neglect and now, the mother of these kids is pregnant again, with the baby due in June. It has all the makings of a Lifetime, made-for-television movie, doesn't it? The sadness quotient in this story, however, is off the charts. Three small children trapped in an RV - trapped because their mother locked them in the vehicle, as it burns around them. And now we learn that methamphetamine may be involved. No doubt, more will come out on this case as it progresses, but it is truly one of the saddest stories you're hear about today and perhaps even this month. General Motors received $51 billion in bail out money. AIG was disbursed $68 billion. GMAC received $16 billion. And the list goes on... No one with any functioning brain cells will consider this to NOT be corporate welfare. There was even quite a fuss over a Chrysler commercial during the Superbowl as a result of Detroit automakers receiving corporate welfare. And in Oklahoma, there are companies who receive tax incentives regularly - and even the Oklahoma City Thunder receives incentives and relief from payroll taxes. 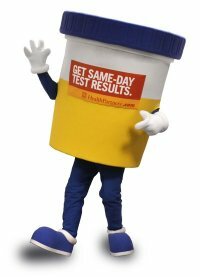 But now, a bill has been authored to require drug testing for recipients of state aid. 1. Will it withstand Constitutional muster? 2. Will the bill apply to the aforementioned recipients of corporate welfare and if no, why not? 3. Will the Oklahoma City Thunder players, staff and management be required to undergo drug testing? 4. Will companies who receive tax incentives or breaks on ad valorem taxes be required to undergo drug testing? The answer to all of the above will probably be "no." Bennett's bill that is clearly designed to be "tough on drugs," will be labeled as racist and inciting a class war. The bill targets recipients of state aid who are at or below poverty, but leaves legislators, state employees and board members of corporations receiving tax incentives exempt. You can expect this bill to be talked about, laughed at and battled over for many weeks to come. And rightfully so. The duplicitous nature of the bill speaks volumes. 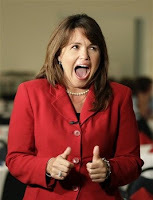 Nor should corporate executives be paid to fly around in their Jet Streams on our dime either, Representative Bennett. For years, veterans have complained to the media about the conditions at the Oklahoma City VA Hospital and Oklahoma City's Fox 25 conducted a few interviews and talked to hospital staff. In the report that ran February 9, we were left with more questions rather than answers. 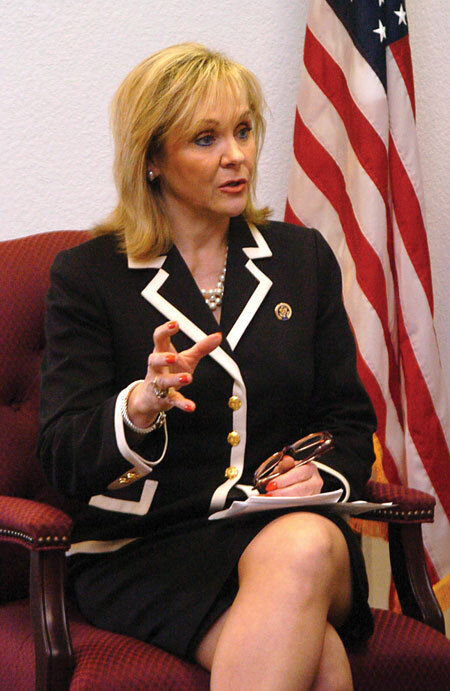 Veterans have also complained for decades to members of the Oklahoma Congressional Delegation and have received mixed reports on the progress. Many veteran's groups such as the Mid-America Chapter of the Paralyzed Veterans of America have made great strides with members of Congress and Senator Jim Inhofe has been actively involved in providing legislative assistance in Washington for disabled veterans. But the problem is much larger in scope than merely legislative assistance. The problem is societal, emotional. Going back to perhaps the Korean war, returning troops didn't receive the same warm reception as they did during WWII and the decline of adoration for members of our Armed Services continues. Men and women who oppose war at all costs have permeated the fabric of the media and the message being sent out is one of apathy. Today, veterans are looked at as civil service employees - not to say that civil service isn't important, but a distinction must be made at some point. Currently, we have boots on the ground in more than one theater and yet, we hear very little about the triumphs and strategic victories the men and women of the Armed Forces are experiencing. We read newspaper reports and watch television stories of the veterans who come home suffering from all sorts of ailments relative to service, with the primary focus on proving the media's point that war is wrong and the mechanism by which war is waged (veterans) are less important than communicating to the masses how evil our country is for even thinking about going to war in the first place. But our country owes a debt of gratitude to our military. And our country should care for our veterans. Reports of how poor the medical care has been to our veterans (including the horrific reports in the past from Walter Reed), should be rare, but unfortunately they are commonplace. It doesn't have to be this way. It shouldn't be this way. Lord willing, it won't stay this way. The dialog is continuing...let's keep it going. 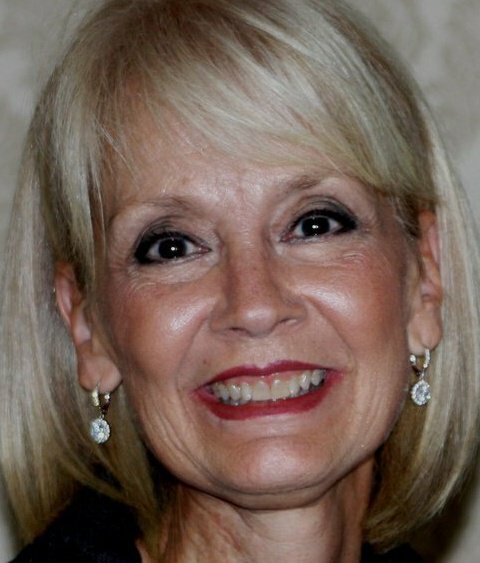 OKLAHOMA CITY – Governor Mary Fallin today announced she has selected Deby Snodgrass to serve as executive director of the Oklahoma Tourism and Recreation Department. The Tourism and Recreation Commission unanimously approved Snodgrass’ appointment Monday. She will replace Hardy Watkins, who is resigning this month. Snodgrass has more than 30 years experience in marketing and public policy in the private sector, most recently as senior director of public affairs for Chesapeake Energy. In that role, she developed and executed strategic political and public policy initiatives, managed both state and federal political action committees and monitored federal, state and local issues in the company’s operating areas. Prior to working for Chesapeake, Snodgrass was a founding partner of the public policy and research firm Cole Hardgrave Snodgrass and Associates. She has been a frequent guest speaker and has taught policy and strategy at various international venues. Snodgrass also was a founding member of the Board of Directors for Friends of the Mansion, Inc. and is a former co-chair of “Opening Night,” Oklahoma City’s annual New Year’s Eve celebration. She served eight years on Oklahoma’s Capitol Preservation Commission and currently serves as a board member for the Arts Council of Oklahoma City. Snodgrass and her husband John live in Oklahoma City. Their son Chase is a student at Oklahoma State University. James Dunn, Oklahoma National Committeeman for the GOP, just forwarded me an email he sent to Matt Pinnell, the Oklahoma State GOP Chair. I have been at the capital most of yesterday working on this very issue. The Senate Judiciary passed today five bills that in essence destroy the peoples constitutional right to a jury trial. My heart is so heavy to know that leadership through Senator Sykes, the chair of the committee, would not even call me when I personally went to his office and left my phone number. I remember being significant to him when I wrote him a $1000.00 check a few months ago and personally brought him an additional $3,000.00 that I raised for him. However, it is not the case now just like it wasn't in committee today when he refused to allow one of his constituents to speak on these very serious issues. The committee, through a motion by Senator Crain, unanimously voted against Senator Sykes allowing the constituent to be briefly heard. It truly is a sad day for Oklahoma when the people are not given a chance to be heard by its elected officials. There is blood on the ground today of innocent victims who have been left behind by Oklahoma GOP leadership. I mourn for them and for all the future innocent victims who will suffer further because our current leadership does not care to hear the truth about the need to protect victims rights and our Constitution. It is clear that Oklahoma's GOP leadership is more worried about politics as usual instead of truly following the constitution and our long history of upholding the rights of "we the people". So let's recap. If you're donating money to Senator Sykes, he'll take your call... otherwise, he avoids you like the plague. 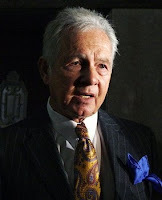 And if you are one of Senator Sykes' constituents and you want to exercise your 1st Amendment right to petition the government to express your concerns, Senator Sykes will do everything he can to make sure you can't be heard if it goes against what the State Chamber wants passed. If you are a constituent of Senator Sykes, I hope you will contact him today at (405) 521-5569 and let him know that you expect your voice to be heard, even if it's not what Senator Sykes and the State Chamber want to hear. For everyone else, please call Senator Breechen at (405) 521-5675 and ask him to reconsider co-authoring this bill. Sen. Breechen ran on being a Tea Party conservative yet he has aligned himself against the Constitution and with the State Chamber on SB 863. Also, since the bill passed the committee (in record time, I must say), we need you to call your State Senator and tell them to vote NO on SB 863. You can find out the name and number of your Senator by clicking here. On Tuesday Governor Mary Fallin will announce a new state tourism Director and will CREATE A NEW POSITION of Assistant Director this Tuesday at 3:30. This despite promising voters to cut government. She will of course be paying back the chair and asst. chair of her inaugural committee. Deby Snodgrass was the chairman of her Inaugural slush fund and will be named the new director of the Department of Tourism. More controversial will be her appointment of Bud Elder, former assistant chair of her inaugural committee, who will be named as assistant director. This will be a newly created position. Elder previously left employment with the state under a cloud which buzzed of abuse of state property and state time. Sources close to republican insiders indicate he was a ghost employee who was placed there for political connections. Rumors that we are unable to verify include that he had abused state cell phones and eventually had it and his car taken away. Sources familiar with the Department of Human Services indicate he was suspected of using state property for personal use. Governor Fallin will follow the trail blazed by Doak in appointing two cronies to these positions. One position will be created and one or two could only assume a position of someone that actually works will be eliminated to pay for this political "payoff". I recognize the name Deby Snodgrass, but can't remember from where. I believe she worked for Chesapeake Energy for a while and then, if I recall, she worked for Ackerman McQueen. If that is the case, you can rest assured that Ackerman will maintain the Tourism advertising contract. Slam-dunk for them and congrats. I know Bud Elder from the WKY days when he and a lady friend ran an hour-long radio show on the weekends talking about movies. If this is true, can it be construed as breaking a voter pledge? I don't know. That's for you to decide. The chicken is thawing, the Little Smokies are ready for the barbecue sauce, the living room being cleaned and the ice buckets are ready. The Superbowl is just about upon us but still, there are other things happening in the world around us and I thought I would share some of the shenanigans out there in Okieville. Wesselhoft's Lottery Loser: The folks over at the Oklahoma Truth Council have revealed a very interesting bill authored by Representative Paul Wesselhoft who, by the way, is running for the State Senate. According to this bill, in order to receive lottery winnings, recipients must show proof of health insurance. I don't get it. Paul is a good guy, with good intentions, but this is through-the-looking-glass craziness. Steele Board: The Board of Education has put itself under the microscope and now every Republican with any kind of power is going after them. Attacking the newly elected Superintendent of Public Instruction and attacking a pregnant woman...well, it was a mistake of Biblical proportions. Now, the Speaker of the House has decided to get some of the action. Read it here on the McCarville Report. Corrupt? The Oklahoman has a pretty interesting story, asking just how corrupt our government may be these days. Take a peek at the story and you decide. Of course, there is a bit of excuse-making, a sprinkle of comparative analysis that gives the reader the feeling that we're not as bad as those other states. A good read nonetheless. Superbowl Sunday: While not a big fan of either team and an even lesser fan of the location of the big game, it is an American tradition wherein we have the ability to eat some great food, enjoy some of the best commercials ever produced and have fellowship of sorts.